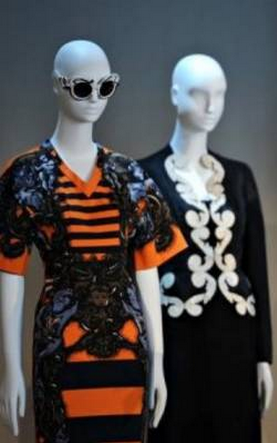 This year's spring Costume Institute exhibition at the Metropolitan Museum of Art will be an all Italian affair. Entitled, Impossible Conversations the show focuses on a juxtaposition between the works of the once famous 1920s and 30s Italian fashion designer Elsa Schiaparelli and the presently critically acclaimed Italian designer, Miuccia Prada. Although the two female Italian designers may appear to have many in common at first glance, they were also quite differed on multiple levels. For example while Schiaparelli was born in Rome, (considered more South of Italy) Prada was born in Milan (the metropolitan north of the country)—two very different environments to grow up in. What the two women did have in common, is that both of them came from very privileged backgrounds. Born to a Neapolitan aristocrat mother, Maria-Luisa and her father, Celestino Schiaparelli, a renowned scholar of classical Italian studies, Schiaparelli was groomed to intermingle with the "so called" European elite. However, the then philosophy graduate young Schiaparelli, quickly began to feel stifled by her family's money—deciding to venture out on her own—she moved to New York. Nevertheless, Schiaparelli ran with a highly artistic crowd—with the likes of Marcel Duchamp and Man Ray—meeting them once she renounced her privileged life in Europe within the New York art scene. 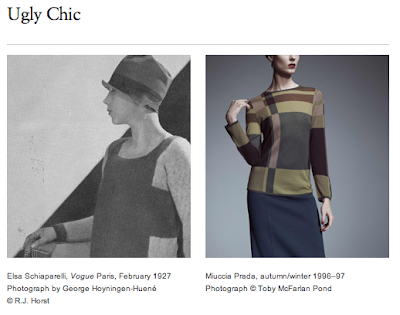 Shortly, thereafter, Schiaparelli moved to Paris to follow the French dadaist she'd met in New York, who've moved back to the City of Lights from The Big Apple. Once the Italian socialite finally settled in Paris, it's when Schiaparelli began her venture into becoming the popular global fashion designer she'd become. It is in the city that couture was born where the young designer launched her first fashion line—ultimately becoming famous and known for pushing the boundaries of style—and admittedly being influenced in her work by surrealist artists such as Salvador Dalí and Alberto Giacometti. 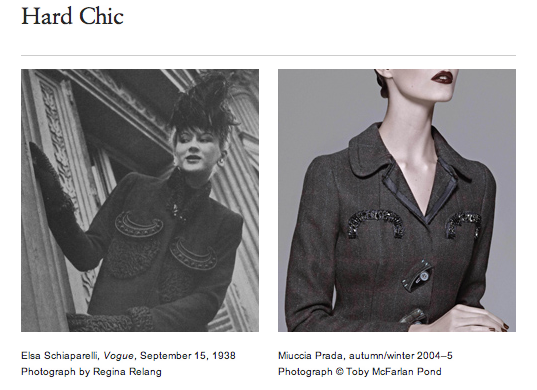 Fast forward a few decades later—the predecessor—Miuccia Prada had just graduated with a PhD in Political Science. And then unexpectedly attending mime school for five years at Teatro Piccolo in Milan. Little did the Prada family know at the time, (when Prada was solely manufacturing luxury leather bags) that the youngest granddaughter of the founder, Mario Prada, that Miuccia would successfully reinvent his company and turn into one of the most prominent luxury fashion brands in the globe. When Miu Miu (Prada's nickname among family and friends), finally decided to join the family business, she started off with launching a very simply yet recognizable line of luxury sporty nylon bags that would put Prada on the map as one of the best selling fashion brands to date. From there, the once young communist would become one of the most business savvy designer and entrepreneur of our time—turning Prada as a multi-billion dollar fashion label—and ultimately acquiring other big fashion houses such as Jil Sander, Helmut Lang, as well as adding Fendi and Azzedine Alaia as its conglomerates. Aside from both women admittedly being proud feminists, like Schiaparelli, Prada is also known for often collaborating with artists. In fact she's even established an art foundation— Fondazione Prada—an art gallery in Milan by Prada, where many highly regarded artists have been commissioned to show their works. And lastly, the 62 year old Milanese fashion mogul also added Miu Miu in 1992, (her nickname), as a less expensive women's wear line, a sister company to the brand, which has also become a sought after label in the world of fashion. And perhaps this exactly where the two Italian fashion designers diverged the most: Although Elsa Schiaparelli became one of the most famous names in the fashion circle pre-World War II, in 1954 her label ended up closing post the WW II era; Prada on the other hand, continuous to blossom into a business fashion power-house and a powerful design reference to be reckoned with. 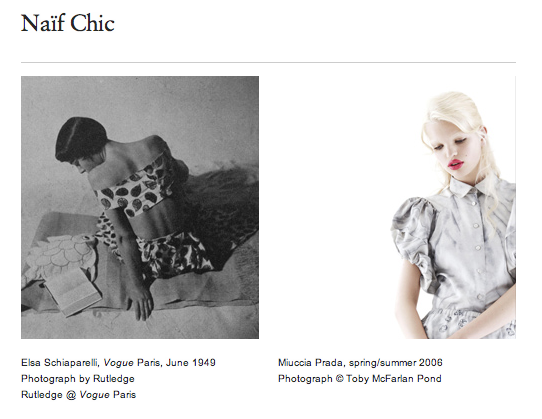 Both of the Italian fashion legends' works will be commemorated at the Metropolitan Museum as the focus of this spring's Costume Institute Exhibition: Impossible Conversations from May 10 - August 19, 2012. The launch of will be celebrated on May 7, 2012 with the annual Met Gala as per usual, hosted by the MET's fashion department as well as Vogue and Anna Wintour, which will also be livecasted. Go HERE to see more details of both the exhibit and the live-streaming coming this coming Monday.